Men in Skirts…The New Fall Fashion Trend for 2018? We’ll let you decide! I know, I know…I shouldn’t subscribe to so many of those boxes but I just can’t help myself when it says Mermaid in the title. Check out the cool mermaid tail mug I got and see what else is in the box. People are livid that she would say that or think that it would ever be ok to fat-shame someone. But, if I were to play devil’s advocate (which I am) is she right and we don’t want to admit it? Is it ok to fat-shame yourself or to do it to someone if they ask you to? How many of us have put up pictures of models and hung them on the fridge to motivate us? How many of us have hung up pictures of ourselves when we wanted to get back to that weight? How many of us have said to our friends our even to ourselves “Ugh! I’m so fat, I need to lose weight.” Aren’t all of those things just versions of fat-shaming ourselves? As a woman whose weight has varied greatly over the years (I’ve lost over a hundred pounds and kept it off for 5+ years then gained half of it back over the next 6 years) I don’t believe that we should fat-shame anyone. Even if they ask us to. Instead I truly believe that we should speak to ourselves with love for our bodies. When I was losing weight, it was at a time that I started to feel beautiful even when I was heavier. That motivated me to work out more, eat more healthy and before I knew it within two years 100 lbs came off. When I started gaining weight and talking badly to myself, all it accomplished was feeling bad and not taking care of myself. We already know that everyone and everybody is different. Different things motivate people differently. That’s the beauty of life and each of us. Knowing that, is it wrong for Megyn Kelly to say that she likes to be fat-shamed? Should she be called out and bashed for her opinion on what works for her? Last night at the Golden Globes it was a sea of darkness. About a week before the event we started hearing that the women attending were going to stand together and wear black as a show for solidarity for the #MeToo and Times Up Movement. Not only did the ladies stand together but the men showed their support as well. That support and message didn’t just show up on the bodies of the people attending but was shown throughout the show and on the red carpet as well. Here are my take-a-ways from the event. On the red carpet women were finally free of being asked “Who are you wearing?” and “Tell me about your look.” Instead better questions were asked like “Why are YOU wearing black tonight?” “Tell me how you feel about being nominated?” “What changes do you want to see?” I think this was a welcome change, women so often at these events are asked about their clothing instead of what they accomplished to be there. I hope to see this trend continue on the red carpets of ALL events. Justin Timberlake may just be one of the best husbands in all of Hollywood. While he was escorting his wife Jessica Biel down the red carpet, they stopped to talk. First they spoke with Jessica (who was nominated for an award) before turning it to Justin and asking him about his new album and upcoming Super Bowl performance. He tried to dodge the questions, when he realized that wouldn’t work he quickly answered the questions before turning the attention back on his wife saying “I’m so proud of her for her what she has achieved and how hard she has worked. This is her night. I’m escorting my wife on her big night.” Well done sir, well done. Inside it was nice to see women standing together, cheering each other on and supporting one another. I think this was shown so clearly between Nicole Kidman and Reese Witherspoon. They were both nominated for the same award and when Nicole beat out Reese they shared a hug, mouthed “I love you” to each other and Reese could be seen beaming at her friend in show of support of what she had achieved. Not only that but during Nicole’s acceptance speech she was sure to thank and gave support to other women in the room. That is the mark of a truly beautiful and strong woman. Acknowledging other women’s strengths and building them up. For me, I swore this year I wasn’t going to watch. I didn’t want to hear the rants, the political speeches or watch celebrities pat themselves on the back. But, I turned it on and found myself happy to see most people handling it with grace, seeing women celebrate other women’s achievements and some women giving accolades to the men in their life. I was happy to see that very few woman lashed out at men and yes, some thought it was in humor but really it came across as harsh and not funny at all…talking about Amy Poehler who bashed Seth Meyers to the point it was uncomfortable and jokes made by Geena Davis about wage gap (trust me, wage gap between men and women is no laughing matter but even that made me feel uncomfortable and it wasn’t the time or place to talk about it). If you didn’t watch, it’s ok. If you did watch then you saw a night that was different from previous awards shows and for the most part I think it was a very good change. Maybe one day soon they’ll experience the joy of being able to pump gas and order food at the same time. 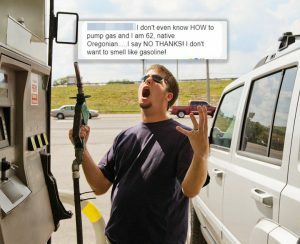 Til then, we’ll just keep laughing at the ridiculous comments and be jealous when we pump our own gas in bad weather. We all know the holidays can be stressful and what helps to ease stress? Cookies and wine, of course! Now you can enjoy them together and look classy while doing it with the help of this little guide. My favorite is a toss-up of the Sugar cookie and Reisling or the Snickerdoodle and Sauvignon Blanc…but that’s just me. Now if you excuse me, I’m going to pour myself another glass of wine and grab another cookie while watching the Hallmark Channel. Happy eating and drinking this holiday season!